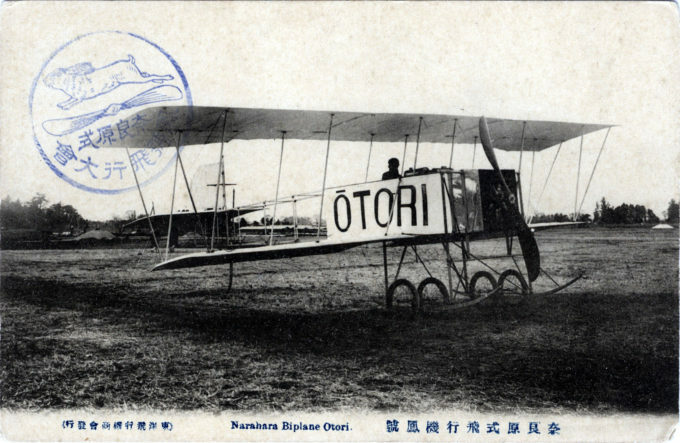 Narahara #4 Otori-go Aeroplane, c. 1912, at Tokorozawa airfield. The go suffix is used as an honorific [ご]; not to be confused with the number go [五, i.e. 5]. “In the autumn of 1911, Narahara’s group was joined by Shuhei Iwamoto, later a professor of Tokyo University, and Kiyoshi Shiga, BSc. By March 1912 they had created the Narahara No. 4 Aeroplane … The aeroplane was built at the Orient Aeroplane Company (Toyo Hikoki Shokai), have its office in Kyobashi, Tokyo. The factory was then located at Fukagawa (near or at Susaki Airfield) and final assembly was made at Tokorozawa where it was to be flown. It received the name of Ohtori-go, after a champion sumo wrestler, Ohtori, at the request of the sponsor who supported the project. “The aeroplane performed well and was taken on exhibition tours, with flightd at major cities throughout Japan to demonstrate what was referred to as their ‘Japanese-made civil aeroplane’. Sincere there were no [public] airfields in Japan at this time, flights were made from race tracks or military parade grounds of such relatively small size that landings and takeoffs were very near the spectators. During the first of these exhibition flights on 13 April, 1912, at Kawasaki Race Track, Kanagawa Prefecture, a failing engine caused the aeroplane to land short, allowing a wingtip to strike a schoolboy, breaking his arm. “The aeroplane was again demonstrated on 11 and 12 May for His Highness the Crown Prince (later Emperor Taisho) and his three sons (one to later become Emperor Showa [Hirohito]) along with Field Marshal Aritomo Yamagata and many other high-ranking officers at the Aoyama Military Parade Grounds.